Some of you out there may have stumbled upon this website by ‘accident’, or by sheer ‘coincidence’. Others of you may feel powerfully drawn to the teachings that the Flower of Life has to offer. In either case, it is quite likely that you have looked at the material being taught in the workshops. Some of this material may seem quite familiar to you - you may have come across similar teachings in other workshops; the concept of opening your heart, contacting your higher self, participating in sacred ceremonies. However, you may be wondering what this ‘Sacred Geometry’ is all about. Geometry – isn’t that the difficult stuff we learned at school only to forget about it as quick as we could? What place, you may be wondering, does geometry have in a workshop dedicated to awakening your light body through the teachings of one of the most ancient mystery schools on the planet? Well, if a similar question has crossed your mind, read on. Sacred Geometry is a jewel. 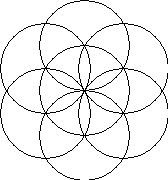 Sacred Geometry grants us direct access to insights not readily available through any other forms of teaching. There are many important teachings in the Flower of Life material, and Sacred Geometry is definitely one of them, a cornerstone of the workshop. And if you take the time to practice it, Sacred Geometry can really blow your mind, although in a subtle way. Why is Sacred Geometry so important? There are many reasons, but basically, Sacred Geometry is valuable to us because it is a meditation for the logical side of our brain. Most of our meditative experiences are centered in the right hemisphere of our brain – the intuitive, emotional, feeling side of us. When we meditate, it usually ‘feels’ good. We can sometimes see visions or images in our meditations, hear calming sounds or insightful voices. All of these sensations are located in the right side of our brain; our emotional / intuitive side. Anybody out there who has practiced meditation may know the dangers of having these experiences entirely in the right hand side of your brain. You may have had the experience of coming out of a meditation where you had a beautiful experience. But then, as you moved back into waking consciousness, you begin to doubt the validity of your experience. You start saying things to yourself like ‘Nah, that can’t have been true, I must have just imagined it, I must have just made it up’. It doesn’t always start straight away, but pretty soon you can find yourself talking down your experience from an amazing insightful meditation to having a nice, if not a little weird, meditation. What is happening is that your left-brain has not been involved in your spiritual experience. The logical side of you has no involvement in your right-brained experiences and therefore does not know what to make of them. So it does what all good logical thinkers do; it begins to take apart your experience using logical, rational questions. That is, it takes a questioning, if not a cynical, perspective. And, as your experience was entirely intuitive and based in ‘feeling’ it has no logical basis or frame of reference. And that’s how we can begin to discount the significance of our internal experience so easily. This is just one of the examples of what happens when your left and right brain are not working together as effectively as they could. The logical side of your brain remains cynical about the value of the experiences happening in the right side of your brain. This is sort of like rowing a boat with only one oar in the water – you can probably get there in the end, but you’ll get there a lot quicker using both oars. So we have a challenge here: we are having all of these amazing experiences and insights in our meditations that are potentially useful for our progress and development, but then as soon as we come out of our meditation, we discount and doubt them as the logical side of our brain kicks in. How can we possibly get around this? How can we get both sides of our brain working together? The answer, if you haven’t guessed it already, is Sacred Geometry. Sacred Geometry is basically geometry that is focused on describing creation and/or consciousness; how consciousness moves through reality. Because it is a ‘doing’ activity (rather than a ‘reading’ or ‘observing’ activity) it directly appeals to the rational side of our brains. That Sacred Geometry is something you have to do is a very important point - it is not something that you can just look at and go ‘Yeah, I get it’. You actually have to pick up pencil, compass and paper and do the drawings yourself. What happens when you do the drawings yourself is that you are involving the left side of the brain directly – you are actually doing something, even building something. What happens then is almost magical. By drawing these pictures (not just by looking at them) you are beginning to describe the very fabric of our reality, the basis of creation in a language your logical side can finally understand. And once you begin to do this, you are giving the left side of your brain, your rational side, a logical explanation of the Unity of all things. And you do this (in part) by describing reality using the very shapes and forms that make up our reality. Then your logical side starts to get it! It begins to get involved in your spiritual experience. And hey presto, you suddenly have two oars in the water – and you’re ‘cooking with gas’. When I drew this picture for the first time, I realized that it described the relationship between the circle and the square, between feminine and masculine. More than that, it describes this relationship in a masculine way (through straight lines – curved lines are said to be feminine). Now you can read the above paragraph and say to yourself, ‘Yeah, that’s true’, or you can actually pick up pencil, compass and paper and draw the picture yourself. Then you can begin to notice the distinct difference between looking at sacred geometry and actually doing it – ‘the difference between knowing the path and walking the path’ . Drawing these forms is not an entirely left-brained experience, however. Forms such as the Egg of Life below have such an inherent beauty and universal appeal in them because they appeal to a basic part within us, within all of us. They speak of a beauty forgotten to most of us, but ready to be awakened once again. A beauty that is not only known intuitively, but a beauty that is also known logically, and therefore holistically. Shapes and forms that remind us of our place in this universe and how we can perceive, move, and create in harmony with the world around us. The forms that create the very fabric of our universe.